Main project objectives: to contribute to increase accessibility to clean energy source in Da Nang on sustainable development basis. 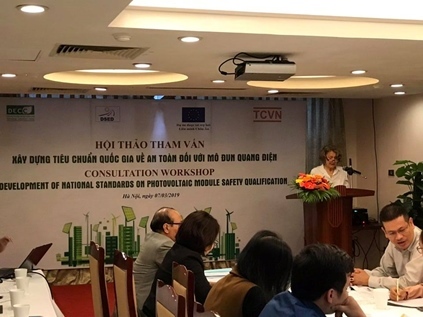 Hanoi- In the 07 March, 2019 morning, The Danang Center of Energy Conservation and Technology Transfer (DECC) has closely coordinated with the Vietnam Quality Standards Institute (VSQI) to organize the consultation workshop on solar PV module safety qualification to take all comments and idea contributions widely to finalize the drafts. The workshop has been with full participants of line agencies, power units, businesses, organizations and individuals. The Project on Solar Energy Development Project (DSED) funded by the European Union (EU) with main objectives of increasing accessibility of clean energy resources on sustainable basics. The Component 2- Pilot installation of solar energy systems in some selected public facilities and households is implemented for replication and demonstration. Pursuant to the Decision No. 08/QĐ-BQLDA of DSED Project Management Unit dated 24 April 2018 approving the Bidding Document for the EU-DECC-1.5 Package on “Development of national standard on solar PV module safety qualification”. the DSED Project Management Unit delivered invited tenders after preliminary assessment of capacity and experience. Pursuant to the Decision No. 07/QĐ-BQLDA of DSED Project Management Unit dated 23 April 2018 approving the Bidding Document for the EU-DECC-1.2 Package on “Survey on solar energy potential application in some selected industrial sectors in Danang”. the DSED Project Management Unit delivered invited tenders after preliminary assessment of capacity and experience. The Management Unit of Project on Development of Solar Energy in Danang (so-called “DSED Project Management Unit) has been implementing the European Union (EU) funded DSED project with main objective of increasing accessibility to clean energy resource on sustainable basis. Decision on The tender dossier for TA Package EU-DECC-1.2 "Survey of the potential of solar energy applications in some industrial sectors"